Three new Expedition 55 crew members were welcomed aboard the International Space Station today. 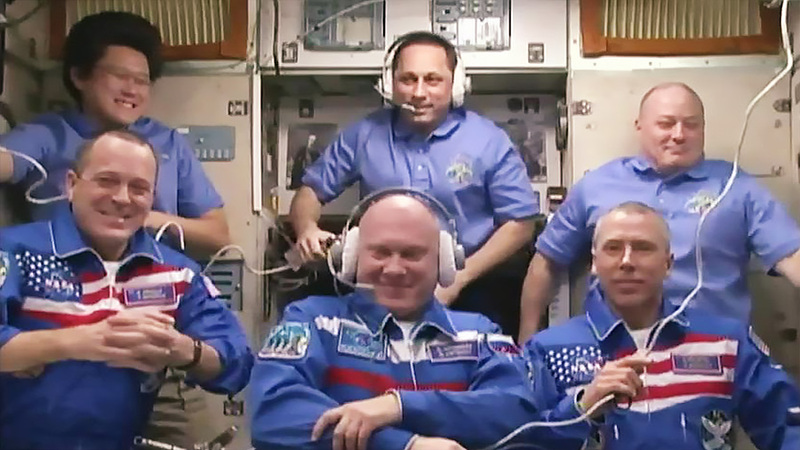 The hatches between the two spacecraft opened at 5:48 p.m. EDT, marking the arrival of Expedition 55 Flight Engineers Drew Feustel and Ricky Arnold of NASA and cosmonaut Oleg Artemyev of Roscosmos. The trio joined Scott Tingle of NASA, Commander Anton Shkaplerov of Roscosmos and Norishige Kanai of the Japan Aerospace Exploration Agency aboard the orbiting laboratory. Momentarily, crew will speak to their family and friends from Baiknour in a welcoming ceremony that will air live on NASA TV and the agency’s website. An error in the photo caption: Drew Feustel is on the right of front row, not the left as stated. Thank you! We have updated the caption. What makes the crews’ faces bloat? I loved watching the launch on Wednesday, but still looking for a video link of the docking with the ISS. It’s always so wonderful seeing nations working together, but it seems this is only prevalent among the arts and sciences. Hopefully this will change one day, and not just out of necessity, but out of desire. Take care. I was in Baikonur myself on March 21 watching not only the launch but could also see the transport of Soyuz from Hangar to Launching Site, see the Cosmonauts going from the Training Center in Baikonur to the Bus taking them to Cosmodrome and in the evening when they bid farewell in their Space Suit and boarded the bus to the Launching Site. All extremely fascinating and once-in-a-lifetime experience, thanks to being member of the Party “Guests and friends” of Oleg Artemyev.